Air pollution masks have been flying off the shelves of stores in the western parts of the U.S. amid a record year for wildfires. Wearing the right mask can literally save your life: studies show that exposure to unfiltered pollution causes thousands of deaths in large cities worldwide. Yet there are only a few objective reviews of which masks do the best job of filtering out toxins — presumably due to the fact that their use originated as an industrial precaution, only becoming a consumer practice in more recent years. Most of the reviews are in Chinese. Apparently, any mask that doesn’t fully seal against the face is ineffective, and so are simple cotton or paper surgical masks lacking filters. Unfortunately, both are common, yet wearing either of those two types of mask can be dangerous if it gives the wearer the kind of false sense of security that leads to spending too much time outdoors during periods of poor air quality, says Dr. Richard Saint Cyr on this blog My Health Beijing. Dr. Saint Cyr emphasizes that studies have found that a properly fitting mask can reduce your exposure to harmful atmostpheric particles. The minimum mask should be rated N95, which refers to the ability to screen out 95% of atmospheric particles that are as small as 3% of the diameter of a human hair, according to the U.S. Environmental Protection Agency. The ratings are actually certifications by the U.S. National Institute for Occupational Safety and Health of the amount of particulate matter these masks can filter out. Stronger air pollution masks are labeled N96 through N100, with each of the numbers referring to the percentage of atmospheric particles that can be filtered out — but a stronger filter won’t compensate for a loose fit on the mask. Dr. Saint Cyr says there are about 200 different masks; 3M brand disposable masks consistently get the highest ratings for performance, while the non-disposables tend to get mixed ratings yet cost substantially more. He also suggests that while the fit around the edges should be snug, there can be enough fabric in the middle to provide ventilation in order for the wearer to breathe more easily. This is especially important for anyone planning to wear the mask while exercising or cleaning. The masks don’t have to be lacking in style — if you want to look sporty, you could buy one of the fabric masks to wear over a disposable. Some of the more stylish brands include Vogmask (shown in the picture above), Cambridge Mask Company, and Totobobo. Meanwhile, the practice of wearing pollution masks is still so new that medical researchers have yet to answer more detailed questions about exactly when people should wear them and how much it might protect health over the long term. 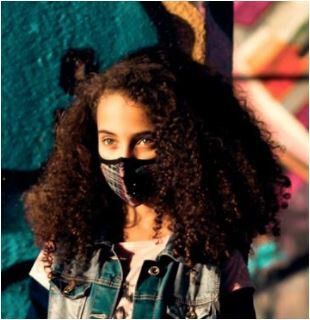 Readers, have you looked into wearing a mask to protect yourself against pollution? Thanks for the mentions of me! I am now working back in the USA but I trained in Santa Rosa — and many of my colleagues have lost their homes there. It’s a terrible situation. Most of my pollution articles are regarding chronic air pollution, but certainly wildfires and the short term risk are very real (heart attacks, asthma attacks, lung infections). So it’s great that people have been grabbing N95 masks, they definitely help against wildfire pollution. Anyone at high risk, especially kids with asthma or elderly, should be wearing one when the air is bad (generally the AQI over 150).